Victoria Pendleton hopes to ride at the Cheltenham Festival next year. Pic: Courtesy of Newbury Racecourse. Olympic gold medallist Victoria Pendleton is set to have her second ride as a jockey at Ripon on Monday where she hopes to partner Royal Etiquette for trainer Lawney Hill. The dual gold medal-winning cyclist has been riding out regularly for Hill since taking up horse racing this year and has said her goal is to ride at the Cheltenham Festival. The 34-year-old had her first ride since switching saddles when she partnered Mighty Mambo for Hill in the George Frewer Charity Race at Newbury in July. 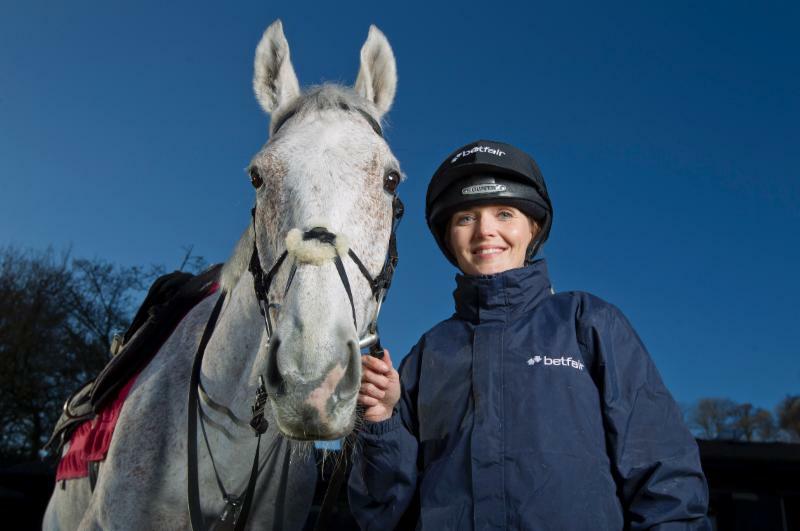 Pendleton has now completed a two-day course at the British Racing School to get a flat a jumps racing licence and is set to ride Royal Etiquette in the 11 furlong Betfair Novice Flat Amateur Riders Handicap on Bank Holiday Monday. “She’s hoping to ride Royal Etiquette on Monday,” Hill said. “She’s done the two-day course at the British Racing School to get the flat and jumps licence. “She’s hoping to get that and then go up to Ripon on Monday and see how we get on. “It’s a race for novice amateurs who have ridden less than three winners, so she will be against other novice riders. “That’s why it was chosen for her and also it’s a Betfair-sponsored race and they are sponsoring her. On her first ride Pendleton finished eighth of 11 runners in the one mile and five furlong contest at Newbury on July 2 and enjoyed the experience. “I loved it,” Pendleton said on her blog after riding Mighty Mambo. “It’s been an amazing four months since I first partnered with Betfair on my journey to become an amateur jockey. “Being a part of this race gave me a huge thrill and to have got this far is an incredibly proud moment for myself and those who have helped me along the way, particularly [team GBR equestrian coach] Yogi Briesner and Alan and Lawney Hill.